Indra K. Nooyi is the president and chief financial officer of PepsiCo. Best known for its Pepsi soft drinks, the international powerhouse that Nooyi oversees is actually one of the world's largest snack-food companies. It makes and sells dozens of other products, including Doritos-brand chips, the Tropicana juice line, and Quaker Oats cereals. Nooyi is one of the top female executives in the United States, and is also believed to be the highest-ranking woman of Indian heritage in corporate America. Nooyi was born in Madras, India, in 1955, and was a bit of a rule breaker in her conservative, middle-class world as she grew up. In an era in India where it was considered unseemly for young women to exert themselves, she joined an all-girls' cricket team. She even played guitar in an all-female rock band while studying at Madras Christian College. After earning her undergraduate degree in chemistry, physics, and math, she went on to enroll in the Indian Institute of Management in Calcutta. At the time, it was one of just two schools in the country that offered a master's in business administration degree, or M.B.A.
Nooyi's first job after earning her degree was with Tootal, a British textile company. It had had been founded in Manchester, England, in 1799, but had extensive holdings in India. After that, Nooyi was hired as a brand manager at the Bombay offices of Johnson & Johnson, the personal-care products maker. She was given the Stayfree account, which might have proved a major challenge for even an experienced marketing executive. The line had just been introduced on the market in India, and struggled to create an identity with its target customers. "It was a fascinating experience because you couldn't advertise personal protection in India," she recalled in an interview with the Financial Times 's Sarah Murray. Nooyi began to feel that perhaps she was underprepared for the business world. Determined to study in the United States, she applied to and was accepted by Yale University's Graduate School of Management in New Haven, Connecticut. Much to her surprise, her parents agreed to let her move to America. The year was 1978. "It was unheard of for a good, conservative, south Indian Brahmin girl to do this," she explained to Murray in the Financial Times. "It would make her an absolutely unmarriageable commodity after that." "Behind my cool logic lies a very emotional person." Nooyi quickly settled into her new life, but struggled to make ends meet over the next two years. Though she received financial aid from Yale, she also had to work as an overnight receptionist to make ends meet. "My whole summer job was done in a sari because I had no money to buy clothes," she told Murray. Even when she went for an interview at the prestigious business-consulting firms that hired business-school students, she wore her sari, since she could not afford a business suit. Recalling that the Graduate School of Management required all first-year students to take—and pass—a course in effective communications, she said in the Financial Times interview that what she learned in it "was invaluable for someone who came from a culture where communication wasn't perhaps the most important aspect of business at least in my time." The rivalry between Pepsi, the flagship product of Indra Nooyi's company, and its Atlanta, Georgia-based competitor, Coca-Cola, is one of corporate America's longest-running marketing battles. In the United States alone, the soft-drink industry is a $60 billion one, with the average American consuming a staggering fifty-three gallons of carbonated soft drinks every year. The battle between Coke and Pepsi dates back almost as long as each company's history. Both emerged as key players in early decades of the twentieth century, when soft drinks first came on the market in the United States. In the 1920s, Coca-Cola began moving aggressively into overseas markets, and even opened bottling plants near to places where U.S. service personnel were stationed during World War II. Pepsi only moved into international territory in the 1950s, but scored a major coup in 1972 when it inked a deal with the Soviet Union. With this deal, Pepsi became the first Western product ever sold to Soviet consumers. The battle for market share heated up after 1975, when both companies stepped up their already lavishly financed marketing campaigns to win new customers. Pepsi's standard cola products had a slightly sweeter taste, which prompted one of the biggest corporate-strategy blunders in U.S. business history: in 1985, Coca-Cola launched "New Coke," which had a slightly sweeter formulation. Coke consumers were outraged. The old formula was still available under the name "Coca-Cola Classic," but the New Coke idea was quickly shelved. This incident is often studied by business-school curriculums in the United States and elsewhere, along with many other aspects of what is known as "the cola wars." Coke is the leader in market share for carbonated colas, but soft drinks remain its core business. Pepsi, on the other hand, began acquiring other businesses in 1965 when it bought the Texas-based Frito-Lay company, and has a larger stake in the food industry. Nooyi did not earn a second M.B.A. from Yale. Instead, her degree was a master of public and private management, which she finished in 1980. After commencement, she went to work at the Boston Consulting Group, a prestigious consulting firm. For the next six years she worked on a variety of international corporate-strategy projects, and went over to Motorola in 1986 as a senior executive. She remained there for four years, leaving in 1990 to join Asea Brown Boveri Inc. as its head of strategy. ABB, as the company was known, was a $6 billion Swiss-Swedish conglomerate that made industrial equipment and constructed power plants around the world. Nooyi's skill in helping ABB find its direction in North America came to the attention of Jack Welch, the head of General Electric. He offered her a job in 1994, but so did PepsiCo chief executive officer Wayne Calloway. As she told a writer for Business Week, the two men knew one another, but Calloway made an appealing pitch for Nooyi's talent. He told her, she recalled, that "'Welch is the best CEO I know.... But I have a need for someone like you, and I would make PepsiCo a special place for you.'" Nooyi chose the soft-drink maker, and became its chief strategist. Soon, she was urging PepsiCo to reshape its brand identity and assets, and became influential in a number of important decisions. She was also a lead negotiator on the high-level deals that followed. The company decided to spin off its restaurant division in 1997, for example, which made its KFC, Pizza Hut, and Taco Bell holdings into a separate company. She also looked at the successful plan by Pepsi rival Coca-Cola, which had sold of its bottling operations a decade earlier, and had been rewarded with impressive profit margins on its stock performance. Pepsi followed suit, and the 1999 initial public offering of the Pepsi bottling operations was valued at $2.3 billion. The company kept a large share of stock in it, however. At PepsiCo, Nooyi has been the chief dealmaker for two of its most important acquisitions: she put together the $3.3 billion-dollar-deal for the purchase of the Tropicana orange-juice brand in 1998, and two years later was part of the team that secured Quaker Oats for $14 billion. That became one of the biggest food deals in corporate history, and added a huge range of cereals and snack-food products to the PepsiCo empire. She also helped acquire the edgy beverage maker SoBe for $337 million, and her deal beat the one submitted by Coca-Cola. 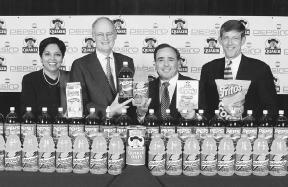 Indra Nooyi (left) and other Pepsi-Co and Quaker Oats executives pose with products from both companies. PepsiCo purchased Quaker Oaks in 2001. For her impressive dealmaking talents, Nooyi was promoted to the job of chief financial officer at PepsiCo in February of 2000. It made her the highest-ranking Indian-born woman among the ranks of corporate America. A year later, she was given the title of president as well, when her longtime colleague, Steven S. Reinemund, advanced to the position of board chair and chief executive officer. Reinemund had said he would only take the job only if Nooyi came onboard as his second in command. "'I can't do it unless I have you with me,'" she recalled him telling her, according to Business Week. Upon taking over as president and chief financial officer in May of 2001, Nooyi worked to keep the company on track with her vision: "For any part of the day we will have a little snack for you," she told Business Week in 2001. The company sold a dazzling range of snack foods and beverages, from Mountain Dew to Rice-a-Roni, from Captain Crunch cereal to Gatorade-brand sports drinks. It also owned the makers of Doritos-brand snacks and Aquafina bottled water. Nooyi's success in the business world landed her on Time magazine's list of "Contenders" for its Global Business Influentials rankings in 2003. Many watchers predict that she will someday head one of the company's divisions, such as Frito-Lay, or its core brand, PepsiCo Beverages North America. In early 2004, there were mentions in the press that Nooyi, who still wears the occasional sari to work, was being considered for the top job at the Gucci Group, but she denied rumors that she had been talking with the Italian luxury-goods giant. Nooyi serves on the board of trustees at the Yale Corporation, the governing board of Yale University. She lives in Greenwich, Connecticut, not far from PepsiCo's headquarters across the state line in Purchase, New York. At home, she maintains a puja, or traditional Hindu shrine, and once she flew to Pittsburgh after a tough session with Quaker Oats executives to pray at a shrine there to her family's deity. Her predictions that her American graduate education would hamper her marriage prospects proved untrue, for she married an Indian man, Raj, who works as a management consultant. They have two daughters who are nearly a decade apart in ages, and Nooyi occasionally brings her younger child to work. The former rock guitarist is still known to take the stage at company functions to sing. Her job, however, remains a top priority. She watches championship-game replays of the Chicago Bulls to study teamwork concepts, for example, and admitted to Forbes journalist Melanie Wells that she strategizes 24-7 sometimes. "I wake up in the middle of the night," she told the magazine, "and write different versions of PepsiCo on a sheet of paper." Kretchmar, Laurie. "Indra K. Nooyi, 35." Fortune (May 6, 1991): p. 112. Murray, Sarah. "From Poor Indian Student to Powerful US Business-woman." Financial Times (January 26, 2004): p. 3. "Nooyi Denies Gucci Talks." WWD (February 27, 2004): p. 2. Pandya, Meenal. "No Going Back: Indian Immigrant Women Shape a New Identity." World and I (May 2001): p. 204. "A Potent Ingredient in Pepsi's Formula." Business Week (April 10, 2000): p. 180. "The Power of Two at Pepsi." Business Week (January 29, 2001): p. 102. Thottam, Jyoti. "The 'Iron Woman' Is Ready to Rock." Time (December 1, 2003): p. 73. "A Touch of Indigestion." Business Week (March 4, 2002): p. 66. Wells, Melanie. "A General in Waiting?" Forbes (January 20, 2003): p. 74. As a career woman who has chosen to be a full time mom , i am in awe of you dear Indra Nooyi! I dont know how you could mange both the home and the career front! As for me i had found it very difficult and now continue to be a full time mom even after having left a job 8 years ago! Though cant say i regret it i love and cherish every moment of my life with my daughter. All the best to you i will want my daughter to have you as her role model! It's very inspirational and gutsy professional life Ms Nooyi has been sailing through.It is really very very tough to perfectly balance career and family life specially in Indian context and tradition.We all know ,how daughter -in -law's achievements are undermined and at home she has sole responsibility for children,kitchen,groceries,guests and of course for her husband comforts. We are really proud of Nooyi for her achievements and cool temperament.